Agnus castus, also known as vitex or chasteberry, has been used for thousands of years for a variety of female issues such as fibrocystic breasts, premenstrual syndrome and infertility. Women might use it for a specific purpose or to promote general hormonal balance. According to the National Center for Complementary and Alternative Medicine, evidence exists that supports some of these benefits, but mixed results, poor design of some studies and lack of reliable information make it difficult to draw any definite conclusions. Some supplementation guidelines have been established, but you should consult with a doctor knowledgeable about herbal medicine for guidance on the appropriate dosage for your condition and other aspects of safe usage. When it comes to herbal medicines, suggested doses can vary depending on whether you take the supplement for general support of a specific organ, function or process or to address a particular health concern. 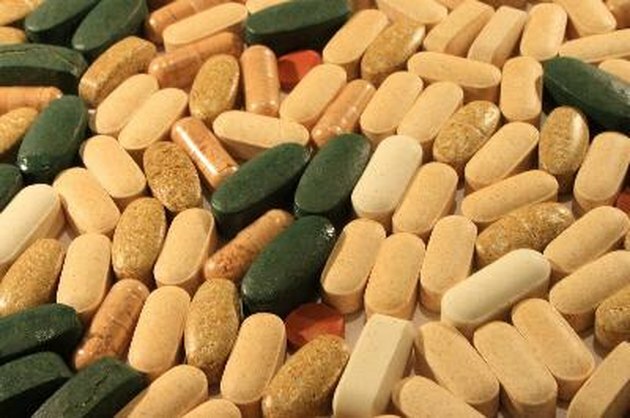 Drugs.com, a website that compiles health information from various medical databases, notes that a daily dose of dried extract might consist of 30 to 40 mg daily. The University of Pittsburgh Medical Center reports a typical dose of dry chasteberry usually consists of 20 mg, taken one to three times a day. The University of Maryland Medical Center, however, recommends 400 mg daily to treat premenstrual syndrome, based on research. No set-in-stone guidelines have been established for use of this supplement, underscoring the importance of professional guidance. Because of its potential effect on hormones, use could prove problematic in certain instances. Using agnus castus at the same time as birth control pills or other hormonal contraceptives could reduce their effectiveness. If you currently suffer from or have a history or an increased risk of estrogen-dependent disorders like breast cancer, you should use chasteberry with caution. Do not use if pregnant or breastfeeding. While chasteberry has a history of use for addressing hormonal issues that can contribute to infertility, you should only take herbs that affect your hormones under the supervision of a doctor, as improper use might only worsen your problems rather than correct them. UPMC notes a long history of use in Germany and a lack of reports outlining significant adverse effects. Potential side effects include rash, itching, acne, stomach upset and headache. Besides a potential interaction with hormonal birth control pills, agnus castus might potentially interact with other medications, and if you take any of them, using this herb could prove problematic. They include medications that affect dopamine production in the brain. It might also interact with any medications used to address issues in the pituitary gland.